Part 3: Mysterious 12,000-Years-Old Gobekli Tepe – Buried to Escape Incoming Comets? Meteorites? Huge Solar Flares? 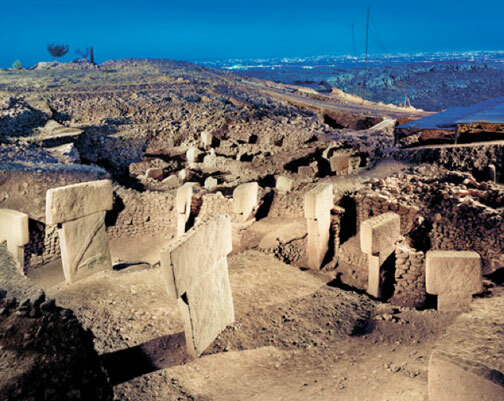 Gobekli Tepe in Turkish means “Potbelly Hill,” an archaeological site about eight miles northeast of Sanliurfa/Urfa not far from the Syrian border. Urfa city lights in background. June 21, 2012 Gobekli Tepe 8 miles northeast of Sanliurfa, Turkey - Who made the 30 acres of elegantly carved Gobekli limestone pillars in circles? And why? More baffling, who? or what? was gathering up tons of soil and carefully piling it over the 30 acres of 19-foot-high, T-shaped limestone pillars - covering them up a thousand years after the pillars had been sculpted by Someone? These 12,000-year-old circles of limestone pillars, cemented bases and brick walls are more than twice the age of Mesopotamia! Was Gobekli being protected because Gobekli creators had foreknowledge about a coming catastrophe? The effort needed to erect so many large stone circles over some 30 acres - and then have to bury all those pillars again centuries later – is beyond understanding. What exactly was the process to re-bury all the pillars? Next PostNext Part 4: Mysterious 12,000-Years-Old Gobekli Tepe, Turkey – Interview with Geologist Robert Schoch.